You are here: Home / Industry News / Searchmetrics’ Search engine ranking factors 2014 is out and rocks! What are the search engine ranking factors that have high rank correlations with organic search results ? The answer is not straightforward and the search engines are not going to let us peek into their algorithms. The short story is : great content, accessible sites leading to great architecture and many natural backlinks. But those three areas degenerate into so many different SEO tasks and processes, each being weighted so differently by Google that it’s often not easy to know what direction to take to improve your SEO. This is when having independent studies looking at correlation data comes in very useful. There are well established companies in the SEO industry building their own tools to help us get as close as possible to how search engines think and do things. One of them is Searchmetrics: an international enterprise SEO platform, and one of the most reliable sources of SEO intelligence and information. For two years in a row they have launched their very own ‘search engine ranking factors’ study. Their second one: the Search Engine ranking factors for 2014 is out now. It is Google US-centred as they indicate, but it can give a very good idea of the direction that Google is taking in general. The report also tells how they performed the scope and research, and of course they make the point clear that ‘factors correlations’ doesn’t imply ‘causation’. It is a very interesting piece and in my view very easy to digest, particularly if you are a visual learner, by just looking at their ‘infographic’. ‘Clickthrough rate’ sticks out as the top search engine ranking factor on Google.com in 2014! I am assuming that this means the number of clicks that a url may get on the SERPs (search engine result pages) for one specific query search term. This is interesting as it can be directly related to many different other factors: branding, good content, but also page tagging. If ‘title tags’ are well written, explicit and branded, they are more likely to attract attention on the search results. And if the page boasts great content, then the page is also likely to have a low bounce rate (as in ‘click back’ to the SERPs). Lastly a call to improve descriptions of your products and test how they show on the SERPs. ‘Time on site’ and ‘Bounce rate’ are also user-level signals being tracked in the study, but although important, I was surprised to see them much farther down in the chart. In my view those three signals go hand in hand. The takeaway here would then be: do as much as you can to improve your content’s presence on the SERPs and ensure content on your landing pages is high quality and engaging as to avoid visitors to bounce back to the SERPs once they click to visit you webpage. Chart with top Ranking factors, from SearchMetrics 2014. Relevant terms, unsurprisingly, stands at the top of the ranking factors chart. This one is probably one that both inhouse teams and agencies find handy to have on this infographic as it helps tremendously to often quote references like this when trying to evangelise the importance of Onpage optimisation. It is clear that every piece of editorial should be written naturally and by authors that know and understand their subject (Content is king). However, from an SEO standpoint, failure to mention underlying target terms or keyphrases in the content leads to poor search engine visibility. This happens quite often, when writers or content owners aim to write in strong academic style and using very selected, subject-specific terms but ‘unpopular’ with their online audiences. Hummingbird has gone some way to counteract this issue but it cannot always be relied upon to make miracles. The second most important fact that outstands on this section is internal links. The top ten ranking urls seem to have one unique characteristic: a count of internal links averaging 130. This is quite a remarkable tip for everyone in my view, as there is often a perception that if every page in the architecture is linked to from the top navigation structure then no additional internal links are needed. Lastly, the study also mentions the importance of embedding images & videos, mentioning keywords related to other relevant terms, and in short, focus on topics instead of single keywords. There is nothing much new in this section since last year’s study. 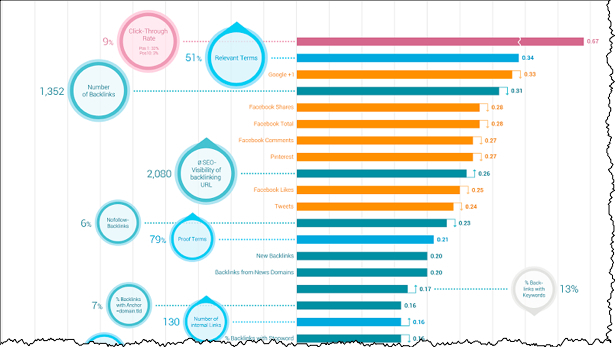 The definite social-drive ranking factor winner, according to SearchMetrics, is Google+. Although authorship is now dismantled, there is still a lot of value in engaging with audiences on Google+. But despite this revelation that came in earlier in the year (2014), the research data from SearchMetrics indicates that there is correlation. Matt may be right that as your content is shared more, you are more likely to get more backlinks, and therefore better traction on the search results. But it could also be that Google, and other search engines, are using social signals ‘indirectly’ to determine quality, authority or reputation and those may therefore lead to better ranks. The important thing to know is that the most people vote for your content on Google+, the more likely you are to rank higher. The second most important social signal correlated with high rankings seems to be Facebook shares, comments and likes. I wonder if this is going to trigger an increase of blogs implement facebook comments via WP plugins. Many already agree that this increases engagement and encourages more comments on blog posts. Lastly Pinterest comes up higher than Twitter! that actually raised my eyebrows. It is no surprise that on their ranking factors study, Links come up right on the top of the chart, only after the social media signal indicators. Not less important is the fact that, as an average, 29% of the overall backlink portfolio was pointing to the homepage, with the rest being deeplinks. It is also worth noting the ‘Nofollow’ links signal higher up in the chart than other signals : ‘new backlinks’ demostrating higher correlation with high ranks that other signals deemed more important, like ‘new backlinks’, or ‘links from News Domains’. And lastly, it is to note that the signal ‘Anchor text’ links as a correlation factor keeps decreasing, with a 13% ratio. This effectively gives you an idea of the share percentage of anchor text links you should have on your site vs Branded links. ‘site speed’ not surprisingly at the top. This ranking factor has clearly been moving up the scale in recent years. ‘position of the (target ) keyword in the Title tag’. This one is a obvious one, although I didn’t it would stick out as importante still. ‘length of the URL’. Another obvious one that seems to be ignored yet in the outside world, particularly for large sites. The shorter the url the greater the ability to rank higher’. The average length for the top ten ranking URL in the study (in characters) was 36. In addition I can also see a bunch of liners mentioning the heading mark-up ( H1 and H2) as important signals. It’s interesting to see this one coming back, as in previous Moz Ranking Factor studies (2011 and 2013), results showed that keywords in H tags did not much correlation with rankings. Lastly, it is worth noting the ‘video integration’ feature as a ranking factor. Bottom part of the ‘Ranking Factors’ Chart, from SearchMetrics 2014. In summary, it is quite an interesting study. I spend well about one hour looking at the infographic in detail and trying to draw conclusions and getting ideas for how to shape up internal strategies inhouse, but also to put to use on my personal humble web projects. The full infographic does delve into great visual details for each of the above groups. The information, in my view, are easy to digest both for SEO professionals and for non-SEOs too. The main takeways from this study are : the imperative need to produce the best content as possible in your niche, get an Onpage optimisation plan in place for your site ensuring you keep your urls short, nice and factual, get involved with the Google Plus social network, without forgetting facebook, do not stop your link building plans at all as you constantly need new links, and work on your site speed until it’s a fast as possible. I’m looking forward to a similar 2014 study produced by Searchmetrics, but ideally with a scope outside the US, eg: France or Spain. I hope that you found my summary useful. Is there anything you found particularly remarkable about this ‘search engine ranking factors’ study? feel free to comment. Great post David! Thanks for sharing with the community such detailed and useful analysis.